Let’s leave Ireland for a moment (we will be back there often as I LOVE it), and take a trip to Vienna. Last September I had the thrill of visiting the Spanish Riding School for the first time. The culmination of a life-long dream spurred by my love of horses. First of all, let me say that I LOVED Vienna. It’s such a beautiful, vibrant and historical city, resplendent in white and ringing with the music of the centuries. From the beat of horses hooves on the cobblestone streets to the street musicians entreating us with their love of Mozart, the mood was bright and aptly reflected by the beaming sunlight from perfect blue skies. The Spanish Riding School was a highlight of our short stay and we registered for an escorted tour of the stables — a building every bit as grand and impressive as the palaces that surround it. The one drawback was, hmm, no photo taking inside the stables. So, what to do? 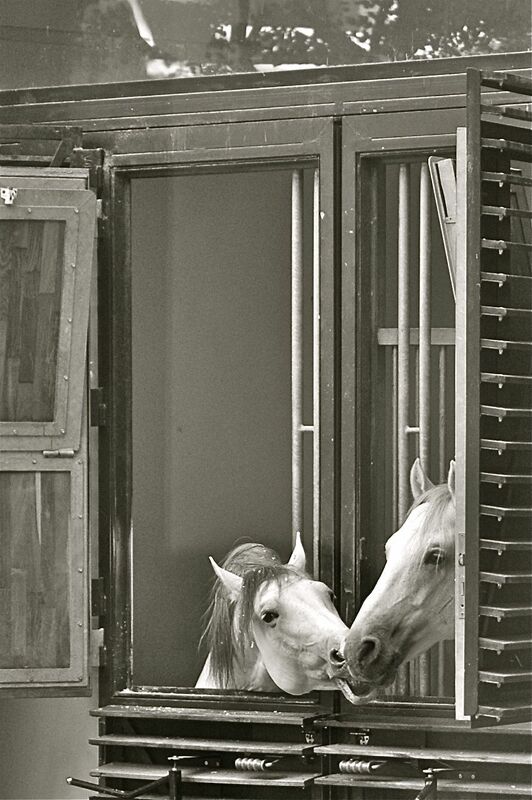 The photo featured here was taken on the other side of plexiglass that divided the stable from the street. As I was watching the interaction between these two horses I managed to find a gap in the crowd and a section of glass not too beaten up. I clicked away with my Nikon D70s, no flash, and hoped I would capture something both memorable and clear. I’m thrilled with the result! It’s a bit of a one-sided conversation between two Lippizaner stallions. The expressions in their respective eyes tell the whole story. This entry was posted in Equestrian, Photography, Travel and tagged Austria, Equestrian, Equine image, Horses, Lippizaner, Photography, Spanish Riding School, Stables, Vienna. Bookmark the permalink. Thanks for visiting my photo blog, and your comment. Much appreciated! Cheerz!